The execution of Josef Müller and Antonín Grmela, 12 December 1914. The chaplain František Havlík was present. Hašek's notes on execution of legionnaires, Samara spring 1918. Celebration in the 7th company, 1st rifle regiment. Čechoslovan announces the victory by Zborów on 2 July 1917. From the trenches by Zborów. © LA-PNP. Retreat from Zborów, July 1917. Masaryk visiting in August 1917. Czech volunteers in Russia, 1917. © VHU. On the origin of the Czechoslovak rebellion. "Gazette de Lausanne" 29 June 1918. Guards from the 4th regiment in Samara. The railway was the mainstay of the Legions. Švec's letter to Stanislav Čeček about the desperate plight of his troops. At the grave of colonel Švec, autumn 1918. The majority travelled home from Vladivostok. The first regiment "Jan Hus" Prague for the first time. The first issue that Hašek contributed to. The beginning of Hašek's "Klub českých Pickwiků". Revoluce 23 April 1917 (6 May). The only known photo of Jaroslav Hašek from his time in the Legions. Here with Jan Šípek and Václav Menger. Berezne 29 September 1917 (12 October). Hašek announcing that he leaves the Czech army. The Czechoslovak Army's arrest order for Hašek, Omsk 25 July 1918. Here imprecisely reproduced in Národní Listy, 11 January 1919. Hašek's service sheet from the legions. Hašek's had according to Czechoslovak law not status as a legionnaire. The law that defined the status of the legionnaires was ratified in 1919. České legie is the author's term for Československé Legie (Czechoslovak Legions) that he mentions indirectly when discussing the field chaplain's role at executions. He lists several examples to illustrate his point, amongst them execution of Czech legionnaires. The answer is that there can be no doubt that the Legions would have been a main focus in the three volumes of the novel that the author had planned but never finalised. Jaroslav Hašek dedicated two years of his life to the Czech-Slovak independence movement, and there is every reason to believe that he would have continued to spice his novel with autobiographical details, add people from his own milieu and episodes from his time there, just as he drew inspiration from his far shorter time of service in K.u.k. Heer. České legie (more commonly Československé legie or Česko-slovenské legie) is a common term describing different groups of mainly Czech (and Slovak) volunteers who fought for the Entente against the Central Powers during WW1 and from May 1918 against the Bolsheviks (Communists) in the Russian Civil War. Politically they reported to Československá národní rada (the Czechoslovak National Council) in Paris (from February 1916), militarily they were part of armies of various Entente powers. From 1916 the Legions were an important instrument in the National Council's campaign to convince the allies to allow an independent Slavic state in Bohemia, Moravia and Slovakia. As Tomáš G. Masaryk, leader of the Czechoslovak independence movement, summarised: "a state without an army can hardly claim independence". Already shortly after the outbreak of war units of Czech volunteers were formed in France and Russia (and later also in Italy). In the novel the author obviously refers to the legions in Russia because it was those he knew and had experience from. Austrian and Hungarian citizens who served the enemy voluntarily had to expect rough justice if they were captured. 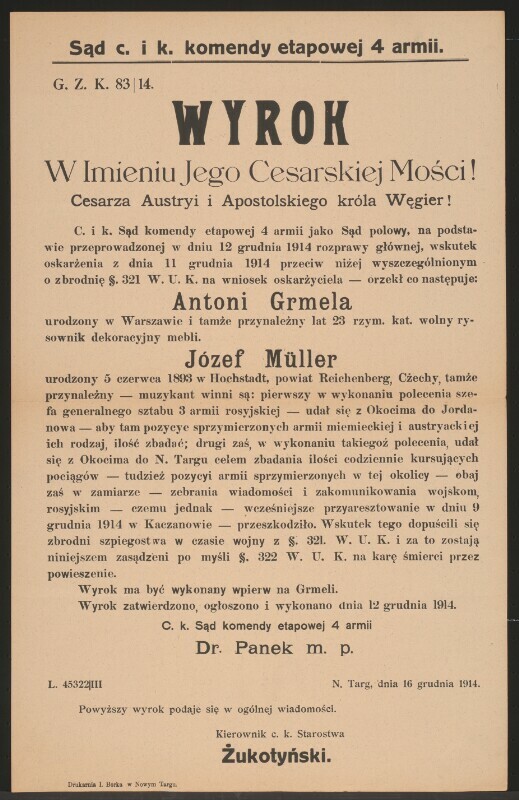 The first Czechs who suffered this grim fate were Josef Müller and Antonín Grmela who were hanged publicly on the square in Wadowice near Kraków on 12 December 1914. František Havlík was the chaplain and witness at the execution (see the next paragraph). Many legionnaires were executed during the war, but this was the first and best known case and Hašek definitely knew about it. Execution of legionnaires continued throughout the war and as late as May 1918 Hašek himself mentions this in a propaganda poster he signed in Samara. The Germans had allegedly executed 200 of his compatriots in Jekaterinoslav (now Dnipropetrovsk) and in Kharkov an Austrian military court had sentenced 12 members of the Russian branch of the Czechoslovak National Council to death. The Bolsheviks also executed a number of Czechs, something the author as a political official in the Bolshevik’s 5th army would have been well aware of. Still it is unlikely that these events would have inspired the passage in the novel, because the Communists are unlikely to have called in clerics for such occasions and the author would at this stage of the novel surely not have aimed his pen at his former comrades. At the outbreak of the First World War around 65,000 Czechs and Slovaks are believed to have resided in Russia (some sources mention 100,000). Most of the Czechs lived in the Kiev Gubernate, mostly in Kiev proper and in the Volyn province near the border with Galicia. Among these were both Russian citizens and Austrian citizens who for various reasons lived in the Russian empire at the time. From both categories volunteers reported to serve Russia and already in August 1914 the Tsar approved the creation of Česká družina as a semi-autonomous and non-fighting unit in the Russian army. On 11 October (the day of St. Václav according to the old Russian calendar) they swore their oath of allegiance in Kiev and then counted 762 men, a number that had increased to 990 by the end of the year. They were mainly given reconnaissance and agitation duties at the front and were assigned to the Russian 3rd Army that took part in the battles by Dunajec and Raba in November and December. The number of "družiníci" grew only slowly until 1917 and recruitment of prisoners was rather unsuccessful. Russian authorities were uncooperative for various reasons: distrust ("once a traitor, always a traitor"), need for skilled labour in factories and agriculture and also doubt about the legality of recruiting prisoners. In the beginning the Russians only accepted those who volunteered on the spot after capture, but in April 1916 these restrictions were eased and recruitment in prisoner’s camps was permitted. Still the large majority of prisoners were under no circumstances keen to return to war duty and recruitment was sluggish. By January 1916 the number of soldiers in Družina had grown to 1,650 and it was decided to transform the unit into a regiment. It was first renamed Česko-slovenský střelecký pluk (the Czecho-Slovak Rifle Regiment) on 2 February and then Česko-slovenská střelecká brigáda (the Czecho-Slovak Rifle Brigade) on 17 April. Thus it was the latter Jaroslav Hašek formally was enlisted in on 29 June 1916 after having reported as a volunteer in the prisoner's camp in Totskoye (these dates refer to the Russian orthodox calendar, 13 days behind our own). During the so-called Kerensky offensive in July 1917 the Czechoslovak brigade for the first time operated as a collective unit in a regular battle. They still counted only around 3,500 (estimates vary) but distinguished themselves by Zborów 2 July 1917 (19 June) where they prevailed against numerically superior enemy forces and captured a large number of them (many of them Czechs from the 35th and 75th infantry regiments - see IR35 and Infanterieregiment Nr. 75). Although the military significance of the victory was negligible, the political impact was substantial: the victory raised attention in Petrograd and even in Western capitals. Important was also that Zborów gave an impetus to recruitment and on 5 September the volunteers were re-organised into 1. Československá střelecká divize (the 1st Czechoslovak Rifle Division) and already on 26 September Československý armadní sbor (the Czechoslovak Army Corps) was formed. At the end of the year they counted around 38,500 and in addition to 8 infantry regiments there was artillery, a sapper company, a reserve regiment, supply- and communication troops. These were functions that previously had been covered by the Russian army but by now the Czechoslovak Corps was nearly autonomous despite still formally reporting to the Russian chain of command. The commanders were even at this time Russian officers. Already in 1916 the Czech leadership abroad contemplated a transfer of the Legions to France in view of the increasingly uncertain situation in Russia. In the autumn of 1917 the war in Russia was practically over and another motive for the transfer was political: on the Western Front they would be more visible to the people who pulled the threads in the Allied capitals - western leaders were still opposed to dismembering Austria-Hungary (Masaryk). The October Revolution and the following armistice gave further impetus and 7 February 1918 the agreement on making the Legions part of the French army was formally signed. A deal covering financial support was agreed in March. Both those agreements were negotiated by Masaryk during his stay in Russia. Prior to this it had been decided to create an official Czechoslovak army of volunteers in France (December 1917) that reported to the French supreme command, but was politically responsible to the National Council. The new order had led to tangible changes even before the deal was formally signed as French military structure and discipline was being introduced. Dissatisfaction with the new situation and also influence from the Bolsheviks led to attrition and some thousands Czechs eventually lent their services to the new regime in Moscow, among them was Jaroslav Hašek. Not to be forgotten in this context is the fact that the Bolsheviks offered better pay (Fic). The transfer to the western front proved difficult to carry out in the chaos that prevailed in Russia in 1918. Some were shipped out early via Murmansk, transfer via Romania and Caucasus was also considered but eventually one decided on an incredible round the world trip via the Trans-Siberian Railway and Vladivostok, later known as "Sibiřská anabase". In February 1918 an agreement was signed between Masaryk and Mikhail A. Murayov (commander of the Red Guards occupying Kiev) on unhindered transport. Sooner than they had imagined the Legions and the Bolsheviks had to execute the evacuation after the Germans on February 18 attacked Russia in order to put force behind their demands in the peace negotiations in Brest-Litovsk. The German advance met little resistance and parts of Legion avoided encirclement after the 6th regiment successfully held up the Germans by Bachmach. The deal on free passage eastwards was confirmed by Josef V. Stalin in mid-March on conditions that the Czechs agreed to partial disarmament. During these days the transfer progressed fairly smoothly but soon the authorities in Moscow put obstacles in the way. This was partly in the hope of recruiting the Legions for their own cause and partly a reaction to pressure from Germany. Large Czechoslovak troop units got stuck in cities like Penza and Chelyabinsk and had to witness that scarce rolling stock was used to transport prisoners from the Central Powers home. A serious incident occurred in Chelyabinsk on 14 May. A Hungarian prisoner was lynched by Czechs after having hurled a metal object at them from a train. Events escalated tension and Trotsky ordered the full disarmament of the Legions. The frustrated Czechs started an armed uprising on 25 May, against the expressed will of the National Council. Simultaneously with the crisis a congress was held in Chelyabinsk and it decided to no longer accept directives from the political leadership. During the next three months the rebels occupied all important points on the railway between the Volga and the Pacific Ocean. In the regions the Czechs controlled the civilian administration was placed in the hands of anti-Bolshevik groups; the left-wing democratic Komuch in Samara and the Siberian Government in Omsk. These governments also established their own armed forces but these proved to be relatively useless as allies (according to Czech sources). The Legions had early been engaged in fighting with Czech Red Guards and at Penza and Lipjag hundreds of Czech Communists were killed. An important consequence of the Czechoslovak take-over in Siberia was that the government in Moscow (and indirectly Germany) now were without access to vast resources. The transport of prisoners of war back home also stopped when the Legions took control of the railway stations and the prisoner's of war camps. German and Hungarian prisoners were often brutally treated and allegedly massacres took place. On one instance two Danish Red Cross nurses were executed as spies (Brändström). The success of the of Czechoslovak Army in June drew attention all over the world, also amongst the Allied leadership. Plans were developed to use the Legions as the spearhead of a new allied front against Germany (hence also the Bolsheviks). This was agreed by the Russian rebel governments and the Czechoslovak political and military leadership. The Entente powers were however in two minds. With Allied support promised, the order was given that the Czechoslovak Army remain in Russia and fight on a new front on the Volga. The order was given by Stanislav Čeček, commander of the western group. At the same time his group achieved contact with the central group based in Omsk. In the meantime the Bolsheviks had reintroduced conscription using brutal methods and harsh discipline. The volunteer Red Guards were now supplemented by a regular Red Army that was partly trained by German officers. The army was furthered strengthened by so-called "Internationalists", soldiers recruited from prisoner's camps. In some sectors they were even dominant, and many of them were German and Hungarian officers and soldiers with long war experience. A dramatic interlude that occurred in 10 July, was the defection of the social-revolutionary colonel Mikhail A. Muravyov, the newly appointed commander of the Bolshevik front on the Volga. His agenda was a common front against the Germans together with the Czechoslovak and the Russian counter-revolutionaries but he was murdered in by Bolsheviks in Simbirsk the next morning. The new front on the Volga was established by mid-July and in the beginning the Czechoslovaks and their allies made progress against the surprised Bolsheviks, and Simbirsk and Kazan were occupied. But during the summer Trotsky had remarkably quickly built up more powerful Red Army. The stronger army and the fact that promised military support from the allies hardly reached the Volga front, left the Czechoslovaks dangerously exposed and from late August 1918 they pulled back with heavy losses, pursued by a numerically superior enemy. The worst set-back was the loss of Kazan on 10 September which was a turning point in war on the Volga. In many cases the enemy was also better equipped. Reserves were virtually non-existent and the Russian allies proved ineffective and unreliable. Amongst the exhausted legionnaires on the Volga-front demoralization crept in and it proved difficult to motivate soldiers for further participation in the civil war. There was also frustration with their own military leadership. On posters and flyers "defence minister" Rudolf Medek as recently as mid-September dreamt in writing about a march on Moscow, and this at a time when it was clear that the new front was doomed to collapse unless reinforcements arrived. From October the unwillingness to fight became even more pronounced as the world war drew to an end and the goal of an independent state was in sight. A tragic incident that illustrated the crisis was the suicide of colonel Josef Jiří Švec on 25 October 1918 at the station of Asakovo. His soldiers had refused to obey order, but this was probably only the trigger for the suicide. Švec, who was commander of the 1st regiment at by Kazan, had already in September in a letter to František Langer expressed frustration over the critical state of his troops and also about his Russian allies who "protected by Czech bayonets enjoy life behind the front" and warned against the increasing demoralization in the ranks of his exhausted men. By October 1918 all cities on the Volga were under Bolshevik control and they pushed steadily eastwards. Their most dangerous opponent was no longer the weakened Legions but the new ruler of Siberia, Admiral Kolchak. He had assumed power through a coup in Omsk on 18 November. From the end of October 1918 the Legions for all practical purposes pulled out of the civil war despite ongoing skirmishes with Bolsheviks and other groups. Since the main political goal of the National Council, an independent state, now was achieved, further engagement in Russia made little sense. Still most of the soldiers were stuck in Sibiria and the Far East until the summer of 1920, and some Czechs units, mainly those reporting to maverick commander Radola Gajda, continued fighting the Bolsheviks as part of Kolchak's army. Early in 1919 the Legions were made to report to the new Czechoslovak authorities, and after the end of the world war the previous policy of non-interference in Russian internal affairs was again in force. Accepting orders from Prague didn't always go down well and in a couple of cases there was danger of mutinies. Another complicating element was admiral Kolchak's coup in the October 1918: the majority of the Czechs had a strained relation to the dictator even if both nominally had a common enemy. After the collapse of his army and his retreat in early 1920 Kolchak relied on Czech protection but the Legions handed him over to a group who later passed him on to the Bolsheviks. In Irkutsk he was summarily executed, an incident that left Maurice Janin and the Legion's leadership in an unfavourable light. The rest of the retreat eastwards passed quite smoothly and by September 1920 the legionnaires had all left for home. After having been a prisoner of war from 24 September 1915, Hašek was in June 1916 recruited by emissaries from Československá brigáda in Totskoye, a prisoner’s camp in oblast Orenburg in southern Ural, east of Volga. Together with a small group of other volunteers he went to Kiev where he was deemed unfit for regular service due to his poor health. Instead he was assigned agitation and recruitment duties. He resumed his activities as a writer and published stories and comments in the weekly Čechoslovan and later in other periodicals. The best known of these was Povídka o obrazu císaře Františka Josefa I. (The story of the picture of Emperor Franz Joseph I.) where he lets a tom-cat from Mladá Boleslav empty his bladder on a picture of His Imperial Highness. The result was a judicial process "in absentia" and some lively correspondence between Polizeidirektion in Prague and K.u.k. Divisionsgericht in Vienna. Unsurprisingly disciplinary problems surfaced also during the author’s time in the Legions. One of these incidents of drunken disorderliness led to arrest and jail. The zenith was reached with the the merciless satire Klub českých Pickwiků where the non-conformist writer insulted six leaders of the Russian branch of the National Council. It was printed in Revoluce 6 May 1917 (23 April). The background was the ongoing squabble between Russian oriented and the western oriented groups in the Czech exile movement where Jaroslav Hašek sided with the first. After the episode he was prosecuted and was forced to apologise to the insulted parties. He was also locked up for a week. From now on he was an ordinary soldier and was assigned to the 1st Regiment's machine gun detachment. In this capacity he took part in the battle of Zborów on 2 July. He also took part in the retreat from Tarnopol after the collapse of the Kerensky offensive. His regiment was from the beginning of August located by Berezne and here Masaryk paid them a visit soon after. Hašek now became a secretary at the regiments's staff, was elected to the regimental committee and was also decorated for his part in the battle of Zborów. During this period he played an important role in exposing the Austrian agent Alexandr Mašek. The spy was arrested and executed when the Legions left Ukraine in February 1918. It was only on 15 November that Jaroslav Hašek was back in Kiev as a writer, although he had written for Čechoslovan already in August. Several of the articles and editorials Hašek wrote in the autumn of 1917 were highly critical of the Bolsheviks. He even described Lenin as a "paid agent of German imperialism" and as late as the turn of the year he voiced similar views. He also attacked Alois Muna and Arno Hais, the leaders of the Kiev section of the Czech Bolshevik movement in Russia. Muna didn't forget this and was instrumental in having Hašek "exiled" to Samara in spring 1918. At this time Hašek and other young radicals toyed with the idea of sending sabotage groups into Austria-Hungary, an idea rejected by the National Council. At the beginning of 1918 the tone seemed to shift towards sympathy for the new regime and there is reason to believe that the young Communist Břetislav Hůla influenced this change in attitude. According to Václav Menger he and Hašek were inseparable at the time. In February this tendency became more pronounced and may have been further influenced by the Bolshevik occupation of Kiev from 8 February 1918. In an article in Průkopník 27 March he mentions two of their leaders directly: Mikhail A. Muravyov and Václav Fridrich. According to Josef Pospíšil he described them (implicitly) as "very capable people". In the article mentioned above Hašek also berated the Legions for not having joined the Red Guards in fighting the advancing Germans. At the beginning of March Hašek and Hůla left for Moscow where they joined the Czech section of the Russian Communist party. Still it was as late as 13 April 1918 that Hašek officially and in writing left České vojsko. The justification was short: he disagreed with the policies of the National Council; to transfer the army to the western front. He also emphasized that he would still work for Czech interests against Austria-Hungary, so he was not yet in direct conflict with the Legions. His writing shows no trace of Marx or Lenin but he emphasises the similarities between the Hussite movement and the Communists. František Langer and Václav Menger wrote that Hašek socialised with his former companions from the Legions even after he had left. These encounters took place both in Moscow in March and in Samara in April and May. From the end of May his situation was complicated by the Czechoslovak rebellion against the Bolshevik authorities. Hašek was now in direct conflict with his former brothers in arms and on 8 June he went underground as the Legions occupied Samara that day. Only three months later did he re-appear and it has been speculated that he during this time had been in contact with his former comrades. According to his own account he hid in the countryside and acted the retarded son of German colonist. This was revealed in a letter to the Czech Communist Jaroslav Salát-Petrlík (17 September 1920) but the recipient was hardly a person to whom he would have revealed any contacts with the Legions. Scattered pieces from various sources (including himself) indicate that he stayed east of Volga at least until mid July but thereafter news about his whereabouts are less reliable. Dramatic events at the beginning of July changed the situation to the extent that Hašek now had good reasons to return to the Legions or at least to their Russian allies. As mentioned above it had been decided that the Czechoslovak Army was not going to France after all, but was to remain in Russia as the spearhead of a new anti German front. This meant that the reasons for Hašek leaving them was no longer valid. Again he had strong common interests with the Legions and the National Council. The fact that the Bolsheviks were now de-facto (reluctant) allied with the Central Powers must have made them inedible to the newly converted Czech Communist. He had as a revolutionary agitator always promoted the fight against the Central Powers side by side with a social revolution, and now this confluence of interests was opening up before his eyes. What went wrong during these turbulent days is unclear but by 25 July 1918 all bridges were burnt. In Omsk the Czechoslovak Army Field Court issued an arrest order for Hašek. The wording was "repeated acts of treason against the Czechoslovak nation". Leading Communists politicians like Alois Muna, Arno Hais Václav Knoflíček and František Beneš were also wanted, but the wording was milder and the order issued a week earlier! Documents related to these warrants surely exist in the War Archive in Prague (VHA) but seem never to have been consulted by Hašek scholars. In September Hašek was arrested in Simbirsk by the Bolsheviks. Presumably it was on suspicion of espionage or contact with the enemy. The Soviets must still have found him useful: in mid October he was sent to Bugulma where he served the rest of the year as deputy commander. The most thorough (and probably only) scholarly investigation on Hašek by Volga during this period was presented by Pavel Gan at the Hašek-symposium in Bamberg (1983). His paper "Jaroslav Hašek als Rotarmist an der Volga" is very detailed and well documented, but still leaves more open questions than definite answers. That said it is difficult to argue with Gan’s main point: during those days Hašek shared a common cause not only with the Legions but also with Mikhail A. Muravyov, the colonel who on 10 July left his post as supreme commander of the Bolshevik's Volga front to join the Czechoslovaks and their Russian allies in a common front against the Germans. Muravyov was however shot the next morning in Simbirsk by people who were loyal to Moscow so the whole enterprise was probably too short-lived for Hašek to have got news of it (unless he was directly involved). Gan concludes that Hašek after the death of Muravjov went into hiding, thereafter served the Bolsheviks, disappeared again in Samara before finally reappearing in Simbirsk in October. From October 1918 to October 1920 Jaroslav Hašek served directly in the Bolshevik 5th army, but was then sent back to his home country by Comintern to support the revolution locally. After returning to the now independent Czechoslovakia in December 1920, his break with the Czechoslovak Army had consequences. He was not a legionnaire according to the letter of the law, which meant he was stripped of pension rights. He was also met with hostility in wide circles and many of his former friends shunned him. In one case the police had to intervene to protect him from a lynch mob (Janouch). Several of Hašek’s associates from the time in Russia achieved prominent positions in the new Czechoslovak Republic: Jan Šípek, Jaroslav Kejla, Rudolf Medek and František Langer amongst others. The great majority of the legionnaires were Czechs as Slovaks counted only around 7-8 per cent. There were probably more Russians than Slovaks in the Czechoslovak Army and also some Serbs and representatives of other nationalities. Jaroslav Hašek himself announced in April 1918 that he literally left České vojsko (the Czech Army), reflecting the fact that this was by and large a Czech army. The German and Jewish population of Bohemia and Moravia were virtully non-existent in the Czechoslovak independence movement. The legionnaires themselves viewed the term "Legion" as an insult and it was only after 1918 the the word became widespread. After 1918 the Legions former a natural backbone of the Czechoslovak armed forces and the officers in particular were given prominent positions in the army and in the air force. The Legions were in the First Republic an important part in the nation building and were celebrated as heroes and national symbols. Literature about them proliferated, for instance the magnum opus Za svobodu (For Freedom), an important source for this write-up. Many monuments were erected and many streets were given names that associated them with the legions. Legionnaires advanced quickly in the state hierarchy and not the least in the military command structure, at the expensive of the great majority that after all had stayed loyal to Austria-Hungary. During Communist rule from 1948 to 1989 the Legions were largely portrayed in a negative light - as "white Czechs" who intervened in the the Russian Civil war, paid by imperialists and reactionary states. Since 1990 the Legions have obviously been rehabilitated and is again a source of national pride in the Czech Republic. New literature about them appear regularly and the rich archive material is still not fully researched. Wyrok Sad c.i.k. komendy etapowej 4. armii. [1.11.1] Velká jatka světové války neobešla se bez požehnání kněžského. Polní kuráti všech armád modlili se a sloužili polní mše za vítězství té strany, čí chleba jedli. Při popravách vzbouřených vojáků objevil se kněz. Při popravách českých legionářů bylo vidět kněze. K.u.k. Militärärar is first mentioned when Švejk tells the pious teacher in Vršovice how serious it is to illegally posses military property. The word appears again when Katz argues with the commander at Vojenská nemocnice Karlovo náměstí that the military owes him 150 crowns for the blessed oil and travel expenses. K.u.k. Militärärar is a term for the military treasury of Austria-Hungary, i.e. the property that belonged to Kriegsministerium and its property administration. The expression should not be confused with Ärar, the wider term for all state property. The term derives from Latin Aerarium militare and was considered an "Austrianism". It is no longer used in the German language, not even in Austria. See also Vojenská intendantura. [1.11.2] "Kvůli tomu zázraku," dodal Švejk, "můžou mít ještě vopletání. Voni koupili pohovku, a ne žádnej voltář, kterej patří vojenskému eráru. [I.13] To byla tedy ta veliká sláva, o které mluvil Švejk. Polní kurát šel zatím do kanceláře vyřídit finanční stránku posledního pomazání a vypočítal již účetnímu šikovateli, že je mu vojenský erár dlužen na sto padesát korun za posvěcený olej a cestu. Vršovice kostel is implicitly mentioned when Švejk and Katz go to Vršovice to recuperate the field altar which was hidden inside the sofa Katz had sold. Two spots are mentioned: the vicarage and the sacristy. Vršovice kostel is without doubt the is a catholic church kostel svatého Mikuláše in Vršovice. It is in baroque style and was built in 1704. The vicarage is next door to the church. The address information shows that František Dusil was vicar in 1907. Jaroslav Hašek knew this church well because he in the spring of 1912 lived in nearby Palackého třída 363 (now Moskevská 363/33). This was also where his son Richard was born on 2 May 1912. Soon after the family father left his wife and the new-born child. Břevnovský klášter is mentioned because Katz and Švejk got their equipment for the field mass here: monstrance, ciborium and a bottle of mass wine. Břevnovský klášter is a Benedictine monastery in the Břevnov district of Prague. It was founded in 933 and was the first of its kind in Bohemia. The architectural style is baroque and hails from the 18th century. Abbot during the war was Lev Mojžíš, a cleric who has been subjected to claims that he was was a notorious alcoholic and also the model for Katz. In 1951 the monastery was dissolved and the premises handed over to the archive of the ministery of interior (Archiv ministerstva vnitra). In 1990 it was handed back to the Benedictine order. Today Hotel Adalbert and restaurant Klášterní šenk are (inn addition to the monastery) both located on the premises. [1.11.2] Neboť ještě jeli pro sportovní kalich k nadporučíku Witingrovi a potom pro monstranci, ciborium a jiné příslušnosti ke mši do břevnovského kláštera, včetně i láhve mešního vína.